Actually, it might be true for Parisians, that they look down on you for even attempting their language. I’ve had that experience more than once. But it’s not true of all Frenchfolk. Traveling through Bordeaux, for example, I noticed that the locals were visibly relieved to discover that I spoke even a little French. They’d much rather hear me butcher their language and nod politely than be forced to wrack their brains and wrap their tongues around English, that filthy upstart lingua franca (“eh, that title belongs to us!” the Frenchfolk cry. “Come on, it even has ‘franc’ in the name, pour l’amour de Dieu!”). In Paris, though, their English is usually good enough that they’d rather not talk to you at all. I’ve had very positive experiences attempting to speak Spanish in Mexico & the US! Unfortunately I have to agree that the cartoon is pretty spot on for my European experiences. The worst reactions I have received for attempting to learn/use another language is with my husband’s family. In my personal experience Chinese people get annoyed at any attempts for a “gwi lo” to speak their language. You will be swiftly corrected & laughed at. It’s really discouraging! @Rebecca Not all Chinese people get annoyed or laugh at you, though. My family and I are Chinese, and we are very impressed with “gwai lo” who speak Chinese. I’d be more than willing to teach non-Chinese speakers to speak Chinese phrases and stuff (My Chinese isn’t good enough for me to be an actual Chinese teacher, haha). @Clarina Curious — have you ever tried site like ‘conversation exchange’? Funny post! I’ve found the Spanish to be similar to the Italians, in that they love it (and appreciate it!) when you try to speak their language. In areas of America where Hispanic people commonly speak Spanish and English fluently, people seem to be wary of teaching Spanish to you, since it takes away their opportunity to talk right in front of you without you understanding. Either that or they’d rather just speak English with you. @Andrew M. That’s interesting, never thought of inconveniencing them that way. Well…good! I found that speaking Polish in Poland causes the locals to just freak out and panic. Not many foreigners speak Polish so they are often hearing it for the first time. @Dan Squires I’ve had a similar experience in Poland to Dan. I speak the language to “Dinner Conversation” level, and have a pretty good accent (so the wife tells me). I’ve often ended up in conversations with people where they’ve believed that I’m totally fluent and they speak at 300 miles / hour with idioms and the lot thrown in, leaving me wondering how to politely respond. One time on a train from Lublin to Warsaw I got into a chat with an elderly fellow passenger for a couple of hours. I probably understood about half of what he said, but we were good friends by the time I got off! In France I’ve been told off for not speaking French or learning it. In Sweden I’ve found trying to speak Svenska gets confused looks. Norway was great, they are open and chatty and enjoy talking, and seem pleased when you try, and that was as an English native speaking swedish in Norway!!! On a flip side, many people speak poor English too, and having the words but not the flow is very difficult for English natives. But most speak it well. Too well in fact, if you are a foreigner but have a native flawless accent in the UK you will be socially and regionally placed, and that can be an odd thing. Oddly, sounding a little foreign helps the British place you as foreign, and then you will receive ‘guest status’, not a bad thing .It’s not a prejudice in the UK, it’s that we have a mandarin society concerning our own accents, and you will be categorised and treated accordingly. I’m sure it’s the same elsewhere. Not as bad here as it used to be. Actually, the french — particularly the Parisians — are thrilled when you speak to them in French, and the better you speak, the happier they are. Too many people assume it is ok to address them in English and this is an insult to them. If you are a beginner, then yes, occasionally they will get a little frustrated, if you are slow, since often, they are shopkeepers and very busy. However, generally speaking, if you’re trying to speak french, they are *very* encouraging. When I studied in Paris, my friends and I were frequently thanked and complimented on our french and for speaking it with them. They love their language and culture and are happy to speak it with you because they would like you to admire it as much as they do. Not my experience at all in France; they realized I was not French so the bus driver would not serve me till I asked for my destination in working class French; it was tough for me; I’d learned Parisian French; he coached me though, very helpful that way the French were. I saw other tourists and those with teach yourself books who could point to words for things they wanted were well received IMO; those who did not make an effort in French lost. Other countries, different — in Kuwait if I asked in Arabic for a destination the driver looked at me like I was nuts but only some of the drivers were Arabic some were Persian. I know I did not speak dialect. In Egypt I asked for jaami”at ‘l-qahirah — no luck but finally the policeman I asked realized I wanted gumi”at ‘ul-qahirah — Egyptian dialect for jaami”at ‘l-qahirah the university of Cairo so outside of France and with the working class in France knowing the right dialect could be a plus. When speaking French in Paris, I was usually answered back in English. At the Louvre, the teller shortchanged me and when I brought it to her attention (while she was trying to escape her booth) she slapped my 100F into my hand with a firm “C’est exact!” Guess I was understood then. Try speaking a foreign language outside of London in Britain. The British require everyone to speak their language. Few resident Brits have any facility at all with foreign languages. I find that the French (I am a fluent French speaker) will try their best to speak English to someone who obviously has no French at all. @Gerald Stubbs I thought the US had a monopoly on that. And someone who speaks two languages? As for those who speak just one? Nice! In my experience during many holidays in France (which I love), there is never any way I can pronounce the place name ‘Vence’ (in the South of France) that will trigger any recognition with local french people 😀 then when I point at the word and they say it, I can for the life of me not hear any great difference with how I said it… It is like their creative thinking skills for language is turned off. But I love it there. I’ve heard from a man who was working in Italy that he was told “go to America”, since he did not know the Italian/dialect and only spoke English (along with native Ukrainian and second Russian, which did not help). I’ve found on Interpals that when I try to write German people in German, most write back in English. :/ Why then, do Europeans complain about monolingual English speakers? In mainland Japan, people were happy to hear my attempts at Japanese, but would switch over to English. Others (store clerks and the like) would ask if they could practice their English with me. In Okinawa, people are much happier to hear your Japanese and continue the conversation that way. @Jill My experience learning and speaking Japanese is similar, Jill. I find that most Japanese people are incredibly impressed and surprised when foreigners know some Japanese–even just a tiny bit! I’ve been profusely complimented after saying only, “arigatou gozaimasu”! Since Japanese is not widely used outside of Japan, many natives are surprised (but pleasantly so!) when others try to learn their language. I’ve never had a negative encounter, and for the most part my listener has been helpful and compassionate as I have stumbled to express myself in Japanese. @Tony Oh no! I just posted that same joke!!! Sorry…. I speak pretty fluent French and German, and come from Ireland. In France I thoroughly enjoy practising French and generally never run into people wanting to speak English with me. In Germany though I have had a few funny experiences. The one that stands out was when I was working for a German company and travelled to Germany for a training programme. Our group went out one evening and while our group was international our common language was German at our table. On ordering food, a colleague from Denmark but born on Germany, actually ordered in English…afterwards I asked her why, and she pointed out that you get much better service! Now in Germany I just use English – my German is fine, if the waiter wants to practise English I’m happy to oblige. It’s true, service is much better! My attempts at conversing in German came up on an unexpected stumbling block as those present decried my carefully learned Austrian accent. I also defer to my brother who warns that it is wiser to retain sufficient “foreign” accent when speaking whatever language to avoid the worst of the outrage should one unintentionally misspeak whilst lacking fluency, especially with current slang or youth culture. You are very accurate with the Germans. When I visited Germany with my husband several years ago, we were excited to see such historic places. We took a tour of a castle, fully expecting not to understand a word coming out of our tour guide’s mouth. We were happy to just follow along and look all around us. But within the first 5 minutes, the German elderly couple who were with us in the group asked if we could understand their language. We admitted that we knew only a little. So, they asked the tour guide if he would speak in English during the tour for us. He did, and the elderly couple added extra commentary as well since they had visited this particular castle many times. It was a fantastic experience and I was so grateful for their kindness. We found during our stay that many Germans were quick to switch to English once they heard us attempting to speak their language. It was wonderful to encounter such friendly people! I was in St. Petersburg over the summer and found that even a small effort at learning the language will be rewarded. I got along great, and made some really good friends. I believe that people with no Russian at all run in to some difficulty though. When I first came to live in France I had been teaching French in my native England and the French were impressed, or said they were, with my fluency in their language. They liked my slight accent as Jane Birkin was a popular English artist at the time. I even got a free steak from a local butcher who didn’t believe I was English when I spoke patois. I had to show him my passport. All this gave me mixed feelings, not being used to so many compliments. Maybe they were relieved to not have to speak English, even if they’d studied it at school. Nowadays people here have realised the importance of learning languages, especially English, if they want to get on in certain professions. Having taught English for many years to all ages, now retired (still in France), English still seems to be a dodgy number for the French.It’s so different, hard to pronounce and understand for a large number of people. Music inspires the young, but films are dubbed over in French and this isn’t helping. In the South, where I live, they speak Spanish more easily and the Germanic languages are more rare in schools. At present I’m learning Icelandic and have no illusions as to how I’ll manage if I go there. I have been reading about other people’s experiences and am thankful they can mostly speak English. I’m not sure my Icelandic would impress very much! I studied Japanese for three years in college but didn’t go there until 20 years after graduation. I found a little Japanese goes a long way in Japan. I’ve never had anyone respond to my German with English in Germany. In the 70s a couple of times Parisians looked at me like I was crazy when I tried to use my French but just as often they thought I was Canadian. More recently I was struck by how much they are willing to use their English in Paris. Generally I always found the French instantly stick yo French if I even hinted I knew any. I now speak nearly fluent French but have had amusing interactions in France and other countries including the US and Senegal. In all African countries I have found a few words go a long way. My husband has picked up a good bit of Walof in Senegal. The delight his basic greetings and requests in their language were a delight to see, the number of comments hat he was the first Frenchman they had heard learning their language was shocking, in a place with many med term and full ex pats there. In France I have found word snobbery across the country. On one occasion in a ski resort in my early French I was asking for a pain au chocolate. The waiter was refusing to understand me when a lady on the next table said she wants a chocolatine you idiot. Locals are great at jumping in to help when communication breaks down. In NYC my English accent caused so much laughter in a bagel house. I was trying to order a toasted onion bagel with butter and rare beef. Onion bagel – toasted no problem. Rare beef no problem man butter?. Yes butter. man what is this? Me yellow made from milk you put it on toast. Him what?? Me butter I’m not quite sure what else I can say… Enter a local voice from the queue behind me as a lady shouts out she wants budder you idiot! While I was studying in Siberia people often didn’t realize that I was a foreigner at all, because as a German I don’t look foreign to them and Western foreigners are not that common there. And that was despite of me speaking Russian with a not horrible, but obvious accent and a lot of grammar mistakes. When they did realize that I was a foreigner they just kept talking in Russian and were generally very interested and friendly. Just like the Italians in this comic. Unfortunately, nowadays a lot of Russians seem to want to talk about politics with me and I am sick and tired of topics like Crimea or gay rights. 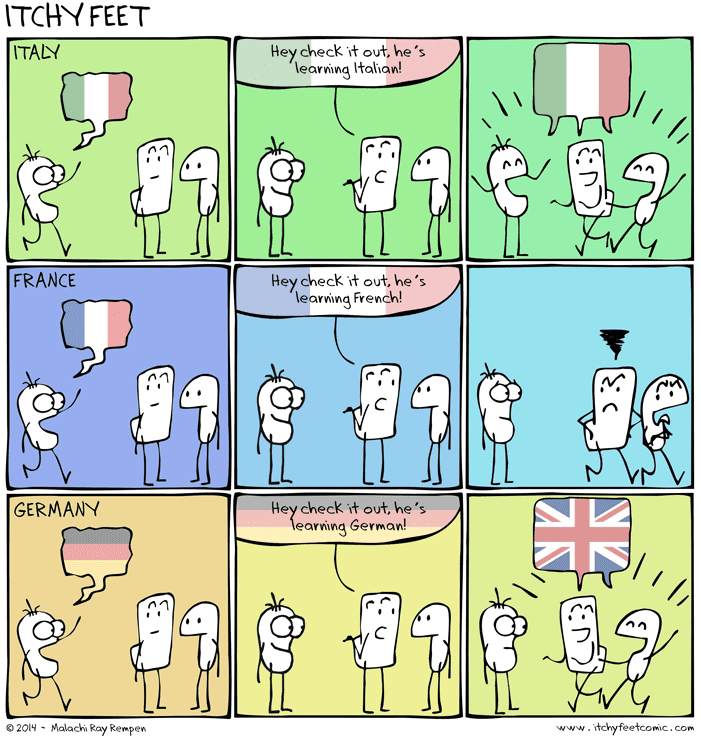 I personally try not to do this “speaking English to foreigners who try to speak German” thing anymore. I have realized that it is a bit impolite. Traveling in Latin America and Spain, people always spoke to me first in Spanish and were always perfectly happy to Conitinue in Spanish, no matter their English aability. It actually caused me some problems because I often assumed they couldnt speak English and realized later I should have watched what I said in English around them more carefully. In Korea, as a beginner speaker it was almost impossible to practice because Koreans assume their language is impossible.for.forigners to learn. However once I miraculously reached an intermediate level with good intonatuon, they switched over.to Korean to speak to me. Now my Korean friends tell me they like being with me because they can communicate in Korean rather than English.